Does your antiperspirant leave marks on your clothes? 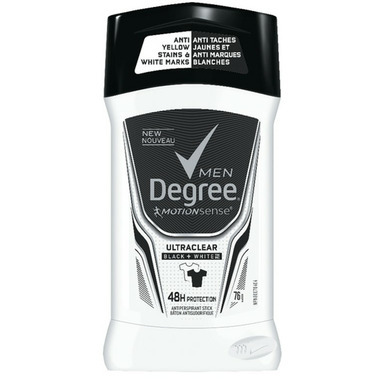 Degree® Men Antiperspirant UltraClear Black + White is specially designed to help keep your clothes looking new. With anti white marks on black clothes and anti yellow stains on white clothes. You’ll look great all day. This antiperspirant has a formula that cuts down on the stains that some antiperspirants leave behind when they mix sweat and natural oils produced by your body. And you know you can stay confident with its long-lasting protection from sweat and body odour. It also contains Degree’s® innovative MotionSense® technology. It works like this: unique microcapsules sit on the surface of your skin. When you move, friction breaks those microcapsules and they release more fragrance. So every time you move, MotionSense® keeps you fresh and free from odour. Ingredients: Aluminum Zirconium Tetrachlorohydrex GLY 11.4%, Cyclopentasiloxane, PPG-14 Butyl Ether, Stearyl Alcohol, Polyethylene, Hydrogenated Castor Oil, PEG-8 Distearate, Parfum, Silica, BHT.